Collective action initiatives in which governments and companies make anti-corruption commitments have proliferated in recent years. This apparently prosocial behavior defies the logic of collective action and, given that bribery often goes undetected and unpunished, is not easily explained by principal-agent theory. Club theory suggests that the answer lies in the institutional design of anti-corruption clubs: collective action can work as long as membership has high entry costs, members receive selective benefits, and compliance is adequately policed. This article contributes to the debate by examining how these conditions manifest in the case of anti-corruption clubs in the realm of international business, with particular focus on the international dimension of many initiatives. This vertical aspect of institutional design creates a richer, more complex set of reputational and material benefits for members, as well as allowing for more credible and consistent monitoring and enforcement. In international business, corruption often takes the form of bribery - exchanges between government actors who ‘demand’ bribes and business actors who ‘supply’ them, in return for privileged access to governmental resources, whether contracts, licences or favourable regulation. Government actors might solicit bribes in exchange for providing services, or manipulate the award of government contracts so as to benefit themselves or their allies. Company representatives pay bribes to overcome administrative obstacles or win contracts, hoping to benefit their career or simply to allow their businesses to function. Either party may initiate or dominate the terms of the transaction, and both transacting parties benefit at least in the short term: the public official gains money or some other favour, while the company gains a business advantage. The costs, meanwhile, fall on others – for example, on competitor firms who are denied access to rigged markets, and on the public who receive poor-quality services and live in a society where corruption inhibits economic growth , as well as undermining democratic values and the rule of law . Scholarship in economics and law has typically characterised bribery as a principal-agent problem, in which the principal (e.g., the public) finds it difficult to control the agent (a public official) because of an information asymmetry . Public policy solutions have sought accordingly to reduce the information asymmetry through increasing transparency and/or by reducing the incentives for the principal to cheat, e.g., increasing the risks and costs associated with corrupt conduct through tightening law enforcement and increasing penalties [4, 5]. Recent scholarship has, however, pointed out that these solutions assume that those setting and enforcing the anti-corruption policy are themselves immune to corruption, an assumption that may be ill-placed. Rather, in some contexts, there may not be any ‘principled principals’ ; that is, the relevant principals – e.g., legislators, law enforcement authorities, audit offices or civil society organisations (CSOs) - may themselves be corrupt or at least complicit in corruption, rather than being standard bearers who impartially enforce the rules. The implication is that corruption, at least where it is systemic, should rather be characterised as a collective action problem . Reduced corruption is a public good from which society as a whole would benefit, but a defining characteristic of public goods is that their benefits are non-excludable, i.e., they accrue to all members of society, regardless of whether an individual contributed to the effort to provide the good. Since any action taken to eschew or fight corruption is costly to the individual, not least because it means foregoing the immediate benefits of engaging in corruption such as the ability to access a favour or business advantage - or, in the case of extortion, to avoid some kind of harm - rational individuals or organisations will hope to free ride on the anti-corruption activities of others rather than participate themselves. If everyone thinks this way, no-one will act and the cumulative effect will be that nobody tackles corruption. This is a collective action problem as defined by Olson  in his work on social movements. The problem is exacerbated in the case of corruption, however, because of the secretive nature of corrupt transactions. Both parties to a corrupt transaction have an interest in keeping it secret, and the public officials involved often also have the power to constrain access to information and hence protect themselves from scrutiny. This means that it is not only difficult to observe whether actors pay or receive bribes, but also difficult to monitor whether they are living up to any self-professed commitments to abstain from corrupt behavior – the latter is a second-order collective action problem. We might therefore expect actors on both the demand and supply sides to maximize their participation in bribery: those with reformist intentions will surely be defeated by the collective action problem, and those who are not convinced will simply continue, secure in the knowledge that they are unlikely to be caught. Yet a curious phenomenon has emerged: many government and business actors, operating in contexts where corruption is rife, engage in voluntary and collective action against bribery in international business. This can be seen in a proliferation of initiatives, some led by the demand side, others by the supply side, many involving collaboration among the two main parties and sometimes involving oversight bodies from government or civil society too. In these initiatives, governments and companies make commitments and support policies that fight corruption, even though doing so constrains their own ability to profit from corrupt deals, exposes them to scrutiny, and invites criticism. This kind of voluntary collective action is not unique to the sphere of anti-corruption: it is evident too in international initiatives that seek to reduce harm caused to the environment or to protect human and labour rights in international business by seeking to end ‘sweatshops’ [8, 9]. However, it is especially surprising that collective action emerges in the sphere of corruption in international business, given the relative ease with which corrupt acts can be concealed and hence the relatively low levels of reputational and legal risk associated with free riding. On the demand side, political institutions tend to commit to transparency or agree to enact ‘right to information’ laws that constrain their future actions in various ways, including by limiting their ability to engage in corruption and rent-seeking [10, 11]. In the Extractive Industries Transparency Initiative (EITI), for example, governments commit to make transparent the payments they receive from extractives companies and to require companies operating on their territory to publish what they pay. Further, they submit these accounts to external reconciliation, invite civil society organisations to oversee the process, and expose themselves to international scrutiny. The Construction Sector Transparency Initiative (CoST) seeks to apply learning from the EITI case to build a similar set of commitments in the construction sector, another area highly prone to corruption risk particularly relating to large infrastructure projects. The Open Government Partnership (OGP), meanwhile, provides a platform to which governments make commitments to open up their activities to scrutiny, apparently undeterred by the prospect that this may invite criticism, not to mention making it more difficult to engage in abuses of office. On the supply side, some businesses make pledges to eschew corruption in integrity pacts or undertake reforms way beyond the demands of legal compliance with anti-bribery laws [12, 13]. Many companies have voluntarily committed to implementing principles for responsible business (such as Transparency International’s Business Principles for Countering Bribery) or have joined collectives that work together to fight corruption. The World Economic Forum’s Partnering Against Corruption Initiative (PACI) is a cross-industry forum that brings together business leaders, international organisations and governments to address corruption risks and transparency. It is also seeking to catalyse collective action initiatives in the real estate and infrastructure industries. A B20 Task Force on Transparency and Anti-corruption seeks to improve transparency relating to government procurement; provides anti-corruption training for small and medium-sized enterprises (SMEs) and public officials; and encourages the utilization of collective action strategies in particular sectors. The B-Team, another voluntary collective of business leaders, has made anti-corruption one of its core programmes and is helping governments to implement commitments made at the London international anti-corruption summit in May 2016 . Other anti-corruption initiatives in the business arena are sector-specific. Such groups pose an even greater challenge to the supposed logic of collective action, given that their members are direct competitors and might be expected to eschew cooperation in such a sensitive area owing to anti-trust concerns. Yet many initiatives have emerged and often in sectors that are associated with higher levels of corruption. The Wolfsberg Banking Group was arguably the first collective action initiative of this kind, dating back to 1999, when a number of major banks came together to draft self-regulatory standards to help tackle money laundering, terrorist financing, corruption and sanctions-busting . In the defence sector, the Defence Industry Initiative on Business Ethics and Conduct (DII) has 77 members that have committed to the DII’s self-governance principles. Some groups of companies have drafted codes of conduct for their industries, e.g., the Hanoi Principles for Voluntary Codes of Business Ethics in the Construction and Engineering Sector. How can we explain the proliferation of such behavior, which runs counter to the predictions made by collective action theory and appears especially ‘irrational’ in the case of corruption? This article develops theory on the conditions in which collective action initiatives are launched and become sustainable specifically in the area of bribery in international business. The theoretical framework draws on club theory to identify three key conditions for collective action, and explores the ways in which these conditions are shaped and augmented by the international dimension of cooperation. The framework is elaborated with reference to evidence collected on a range of initiatives including the Construction Sector Transparency Initiative (CoST), the World Economic Forum Partnering Against Corruption Initiative (PACI), the Joint Money-Laundering Intelligence Taskforce (JMLIT), as well as some in-country initiatives in developing countries. The framework is then applied to in-depth analysis of two cases: in the extractives sector, the Extractive Industries Transparency Initiative (EITI), and in the maritime shipping sector, the Maritime Anti-Corruption Network (MACN). The discussion elaborates on how this vertical aspect of institutional design – that is, the international-domestic interface - enriches the characteristics of the clubs. It also raises questions for future research. The research comprised three elements: (i) documentary analysis; (ii) semi-structured interviews with key stakeholders; and (iii) observation of meetings. The founding and operational documents of the two main case studies were analysed and coded for evidence of the existence and nature of the three conditions. This analysis was used to develop a questionnaire to guide semi-structured interviews with key stakeholders. The 16 interviewees comprised individuals who had played a role in founding anti-corruption collective action initiatives in international business, including cross-sectoral initiatives as well as sector-specific programmes, or had participated as members. Several respondents had direct experience of more than one initiative. In addition, in the case of the EITI, the author participated as an observer in a series of multi-stakeholder group meetings in the United Kingdom. ‘Club theory’ argues that individual actors can be incentivised to engage in collective action if it is organised under the auspices of a club, hence offering a possible explanation for the proliferation of voluntary regulation . Potoski and Prakash note that many of the voluntary clubs that have emerged over the last fifteen years in the corporate world differ from a model of straightforwardly providing benefits to members. Rather, these voluntary private regulation initiatives seek to induce their members to engage in self-regulating behaviour that produces positive externalities. Clubs tend to focus on thematic areas, setting standards around such issues as reducing pollution, paying higher than market wages, international accounting standards, or refusing to deal in diamonds from conflict zones [8, 15, 16]. Club theory identifies a set of conditions in which clubs can overcome the collective action problem and minimize free riding: (i) costly membership (signaling credibility); (ii) selective benefits of membership, which can take both material and social (reputational) forms; and (iii) adequate monitoring and enforcement of rules around compliance. Get these incentives right, club theory suggests, and actors will be motivated to join, even if doing so involves making commitments to self-restraint. The subsequent three sections of this article elaborate on these conditions and consider how they are operationalized by collective action initiatives formed to combat corruption in international business. The article also contributes to theory, by highlighting the importance of the international dimension of many anti-corruption clubs. It is well established that international cooperation can have transformative power over countries that wish to join clubs or gain access to benefits such as aid or foreign investment [17, 18, 19]. This article argues that the international dimension considerably enriches the transformative power of these clubs, by creating a more complex web of relationships among actors, which serve as channels of influence and as checks on compliance. The international dimension affects all three club conditions. First, the international dimension allows actors to access international norms that differ to local norms, and hence to aspire to ‘tougher’ standards in terms of fighting corruption. Second, the presence of international actors with an interest in encouraging domestic actors to join the club creates a much richer and more complex set of membership benefits. This includes non-material benefits associated with building a reputation and demonstrating adherence to international norms and is often related to performance on certain governance indicators [15, 20, 21, 22]. Third, the international dimension increases the possibilities for monitoring and enforcement, by introducing an independent third-party aspect to monitoring, i.e., the existence of a ‘principled principal’ embedded in a different set of norms and reputational considerations. Thus, international anti-bribery clubs allow certain actors within government and business to step outside domestic contexts of endemic corruption and overcome the second-order collective action problem, i.e., the lack of principled principals within their domestic political context, by allowing them to access a different set of norms and leverage the credible commitment to those norms to change domestic behaviour. This thinking draws on Putnam’s characterisation of international negotiations as a search for common ground between two countries in a two-level game . Each country must first negotiate with multiple actors in its domestic political arena (the domestic game), to agree a negotiating position, before playing a different game with the international interlocutor, but arriving at a position which both sides can accept. There might be a fairly small area of overlap between the two games. If one actor disrupts one game board by veto-ing a previously accepted position, for example, this can prompt difficulties not just at the international level, but also on the other party’s ‘home’ game board. However, if the parties can find that sweet spot where they both win on their home game boards, a deal can be struck. The model provides insights into how international anti-corruption clubs can incentivise some actors, through the promise of club membership, to move into parts of their domestic game board which they would not otherwise reach. Once operating in that part of the game board, actors are motivated to self-regulate so as to maintain their status and may also develop an interest in monitoring the behaviour of others. In the right conditions, international norms will spread or ‘diffuse’ and this can lead eventually to a change in norms in the local context . If joining a club were cheap or easy, then members would be able to access the benefits of membership without undertaking the relevant obligations, i.e., demonstrating the appropriate behavioural patterns. This would make membership a meaningless signal of effort and devalue the actions of the joiner, as well as all other members (who therefore have an incentive to police compliance among their peers). For initiatives that seek to induce behavioural change, it is therefore important that significant and tangible behaviours are required before the honour of membership is conferred: joiners must be prepared to invest before they receive benefits. On the other hand, the costs should not be so onerous that it is difficult to attract members. Clubs tend to benefit from economies of scale and network effects providing they can quickly reach a certain size . This reflects the endogenous dynamics supporting membership growth in that individual members have more reason to expect success and thus to participate if a club has more members (although there may also be an upper limit, given that reputational benefits are only forthcoming if membership facilitates discrimination among peers). There is thus an incentive to set membership conditions relatively low initially so as to attract enough members to gain momentum, and then ratchet up the demands on members over time. The research for this paper suggested that there is a great deal of variation among the founding strategies of anti-corruption clubs, but nevertheless demonstrated a common approach – almost all of the respondents interviewed noted the importance of allowing collective action groups to develop organically according to the priorities of the participants. Most clubs began with simple meetings to discuss common problems, and only gradually developed into standard-setting initiatives or associations with rules. The costs and conditions of membership were therefore arrived at through debate among the founding members. Many respondents took the view that the rules should be ‘homegrown’ as much as possible, and regarded as such. Even if there is accepted best practice on anti-bribery policies, it is important for participants to arrive at their own versions. On the other hand, the Financial Action Task Force (FATF) has been criticised for being exclusive and even secretive in the way that it drafts its rules, leading to the charge that it is a rich countries’ club with excessive power over poor countries. Anti-corruption clubs typically seek to induce governments and companies to engage in three types of self-regulation. First, they often ask participants to make public commitments to avoid paying bribes, by signing integrity pacts or introducing zero-tolerance policies on bribery. This provides a clear benchmark against which the behaviour of actors can be judged, at least to the extent that their behaviour in business transactions is observable and where there are active observers with the skills and autonomy to expose breaches. Such commitments expose participants to reputational risk and give them a strong incentive to implement their pledges for fear of being exposed as a cheat or hypocrite (as well as corrupt). Second, anti-corruption clubs often require participants to make commitments to transparency and financial disclosure. This produces an intermediate good - increased information about the company’s activities, which reduces the information asymmetry integral to the principal-agent problem and should immediately increase accountability, providing the principals are interested in and capable of holding the agents to account. Third, clubs sometimes require participants to report incidents in which their employees face demands for bribes. This again exposes participants to potential criticism over their handling of bribe demands, but also yields a benefit to the community as a whole by allowing the collection of intelligence about the loci and patterns of bribe solicitation. The extent to which compliance with these rules represents a cost is highly dependent on the context. In the case of a major anti-corruption collective action initiative in the construction sector, the chair of a national multi-stakeholder group reflected that his role had initially marked him out domestically as “a troublemaker”. However, a new government that came to power following elections was much more supportive of the initiative and this had in turn made it easier for him to recruit new companies as members. 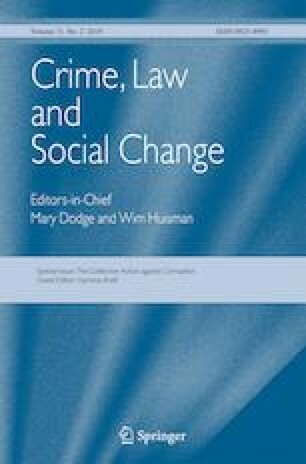 Similar experiences were recounted by respondents from other initiatives: a change in government can create a window of opportunity in which private-sector actors seek to signal that their values align with that of the incoming administration, and joining anti-corruption clubs is one way of doing that. Clubs should also provide ‘selective benefits’, i.e., benefits from which non-members can be excluded and which therefore help to overcome the free rider problem. The benefits might include access to a group meeting, or paraphernalia such as a membership badge or certificate, bringing brand or reputational rewards , or less tangible benefits in terms of reinforcing or maintaining a valued social identity . Thus, companies can be motivated to sign up to ‘green clubs’ by the promise that they can display a certificate of membership, and benefit from doing so by gaining access to new customers or building loyalty with existing customers. In this way, certification schemes have become a form of social regulation that often intertwines with state regulation  and helps to create a market for certain types of responsible behavior, such as corporate environmental stewardship . Interviews with executives suggest that membership of anti-corruption clubs might also yield direct benefits in terms of reduced demands to pay bribes. If public officials on the demand side are aware that a company is a member of an integrity initiative, they may avoid soliciting bribes from that firm for fear of being found out themselves. In this way, the risks for both parties of engaging in bribery can be leveraged to enhance the selective benefits accruing to those willing to pledge abstinence. One respondent explained how, after his company introduced a zero-tolerance policy on bribery, a delivery was stalled outside a compound for several months because the guard would not permit entry without payment of a bribe; after several months, the guard simply gave up on requesting the bribe, and the delivery truck could enter. The company had incurred a significant cost in terms of the delay in delivering the goods, but its persistent resistance eventually paid off and since then it has not had to face the costs and uncertainty associated with demands for bribes at this point in its operations. More empirical research is needed to determine the extent of such benefits. (There may also be hidden costs - e.g., the public officials might desist from demanding bribes but also withdraw access to services or contracts, preferring instead to favour firms with lower standards). Organisations might have plenty of reasons for valuing a reduction in bribe solicitations. According to World Bank surveys of enterprises operating in 88 countries, companies bidding for government contracts are expected to pay bribes in around one in five cases, with an average payment of 11.6% of the contract value . Earlier surveys of enterprises operating in Eastern Europe found that money spent on bribes ranged from 2% to 8% of revenues . There are also major cost implications for companies in terms of the inefficient allocation of valuable organizational resources, wasted employee time and costs associated with managing the uncertainty caused by corruption risk [31, 32, 33]. Being implicated in or associated with corruption can lead to challenges to corporate governance  and unfavorable reputational outcomes [35, 36]. Thus, companies that may have felt able to cope with corruption pressures locally, or at least unable to eschew them easily, find themselves in a different position when operating abroad. Lacking knowledge about how the system works and whom to trust, they are deterred by any sense that the market is not a level playing field and become more invested in spreading norms of integrity. Indeed, in an environment where transparency and integrity are emerging as social norms, membership of anti-corruption clubs can also yield concrete benefits in terms of access to niche markets or entry to supply chains where integrity is prized. One executive of a small shipping firm based in an emerging market in North Africa explained that her company’s decision to join a local anti-corruption initiative had led to it being recognized as a potential partner by a much larger international logistics company. She described this as a very welcome concrete benefit that would help her to argue the case for resisting corruption internally, despite ongoing opposition from various employees who were highly skeptical of the initiative and upon whom she relied for implementation. Another respondent who had been involved in establishing an anti-corruption club revealed that their strategy had been to extract commitments from large companies to provide preferential conditions to their members. A leasing company had pledged discounted rates for companies that complied with the club’s standard and had been thoroughly assessed. This made club membership much more attractive to small local companies, particularly given their poor access to credit in general. In terms of public-public influence channels, development banks often exert pressure on governments to join anti-corruption clubs in connection with projects that they finance, e.g., asking governments to sign up to construction-sector integrity initiatives as they implement aid-funded infrastructure projects. The pressure does not amount to strict conditionality, but rather seeks to put the onus on governments to reject such measures. Another direct benefit from participation in anti-corruption clubs accrues to the individuals who participate in meetings. They report that there is considerable value to them in being able to discuss the sensitive issue of corruption and bribery with peers who face similar problems. Compliance professionals from both the public and private sector benefit from learning how their peers cope with the common challenge of embedding anti-bribery policies in the face of apathy or outright opposition from co-workers that are unconvinced of the need to change practices . Sometimes this has an international dimension, with company employees from one jurisdiction helping to train individuals operating in another jurisdiction. As with other social movements, the importance of these social benefits should not be underestimated in keeping individuals motivated and engaged. Participation in collective action typically has an effect on individual actors’ identities, making them feel pride in a sense of shared community [38, 39, 40]. Effective monitoring of members’ behaviour and compliance with the club rules is important so as to inhibit free riding or shirking, and demonstrate to compliant members that their efforts are valued. The expectation that rule-following will be monitored and violations sanctioned may be critical to convincing members to join in the first place, as well as to ensuring that members remain committed to the initiative over time and maintaining the club’s overall credibility. The design of monitoring institutions is likely to be key to their effectiveness. Two main approaches are discernible, reflecting two underlying theoretical frameworks regarding the role of regulation in shaping behavior, which can be characterized as ‘hard’ and ‘soft’ monitoring or ‘coercion’ versus ‘consent’ . ‘Hard’ monitoring is conducted by external and independent third parties, judges conduct against benchmarks in a thorough ‘auditing’ process, and imposes sanctions where violations of the rules are observed. ‘Soft’ monitoring essentially relies on a norm-based approach, trusting members to adapt their behaviour over time, but not providing formal mechanisms to hold them to account . The Financial Action Task Force (FATF), which sets anti-money laundering standards for financial intelligence units, has opted for the hard approach. It imposes harsh sanctions for non-compliance through ‘blacklisting’ countries that fail to meet its standards for controlling international financial transactions. Countries are extremely keen to avoid being blacklisted as this curbs their access to much-needed finance. This has led some scholars to refer to the FATF as being ‘coercive’ in its nature; although ostensibly voluntary, the organisation’s power to limit access to finance makes it extremely influential and gives it power to elicit reform from actors that might otherwise be reluctant. The softer approach relies heavily on the assumption that members will be motivated to comply by reputational concerns, and that their compliance will be assessed by other actors in society. Its credibility in the anti-corruption sphere has been somewhat blighted by the experience of the UN Convention Against Corruption (UNCAC). While this is theoretically an international convention with binding force on states that ratify it, it is widely regarded as lacking teeth, since many of its provisions are non-mandatory and monitoring of compliance is weak. On the other hand, some argue that commitments to UNCAC may be more meaningful over time: e.g., they often effect change through indirect means, by providing standards against which CSOs and the media can hold states to account. This assumption assumes transparency – i.e., that it is possible to observe the conduct of club members in the relevant areas – and that there will be principals that are capable and interested in holding them to account. However, research suggests that transparency only leads to an increase in accountability in certain conditions, where the broader ecosystem of institutions supports rule following [42, 43]. The role of civil society in scrutinising conduct is, moreover, conditional on the existence of political freedoms as well as on capacity, two areas in which civil society organisations are often constrained [44, 45]. Moreover, empirical evidence on voluntary programs suggests that clubs with weak monitoring systems are not very effective in eliciting responsible behavior. For example, Berliner and Prakash  examine the impact of membership of the United Nations Global Compact (UNGC), an international club which encourages firms to adopt socially responsible policies, but relies largely on a norm-based approach to monitor compliance, with no explicit auditing. Studying the performance of 3000 US firms over a ten-year period, they conclude that Compact membership has no notable effect on members’ human rights and environmental performance, compared to non-members; indeed, non-members perform slightly better. This suggests that UNGC members exploit the lack of monitoring and enforcement to shirk, presumably benefiting from the reputational benefits of membership without being forced to undertake the costly changes to their practices that are theoretically required. Even in the case of ‘hard’ monitoring, however, there is a risk that those charged with monitoring might themselves be corrupt or corruptible. One innovation in institutional design seeks to overcome these problems by establishing structures in which multiple stakeholders make commitments such that they have a clear interest in monitoring one another, in order to sustain their own reputations. Thus, the ‘multi-stakeholder initiative’ (MSI) has become a prevalent institutional design for collective action initiatives [46, 47]. MSIs bring together representatives of three types of organisations – governments, business and civil society organisations – to oversee and monitor the way in which club members behave and particularly the way that they implement their commitments. These actors may have different individual interests yet also share a joint interest in the goals of the club, and in ensuring compliance with the rules. In some contexts, where it is rare for governments, business and civil society to enter into dyadic or triadic discussions, MSIs can have a host of spillover effects as these actors come to recognise previously unknown mutual interests or opportunities for collaboration. Three types of actors operating on two levels – international and national – make for a complex web of relationships for designing membership conditions, offering selective benefits, and undertaking monitoring and scrutiny (see Fig. 1). In addition, relationships exist within the national and international levels, while at the domestic level, companies also monitor one another, and national governments are concerned about their reputation with peer governments. This adds many important dimensions to our understanding of the conditions in which clubs can incentivize collective action, even in such a difficult and sensitive area as corruption and bribery. Launched in 2003, the EITI is a voluntary initiative whereby governments make a commitment to publish what they receive from oil and gas companies, and also require companies operating in their territory to publish what they pay (see https://eiti.org). Any discrepancies between the two sets of figures must be reconciled by an independent validator before a country can publish an EITI Report. The initiative seeks to improve transparency on both sides of the business relationship and by doing so aims to deter corruption and mitigate the resource curse . It spreads the burden of regulation across governments and companies, as well as involving local and international civil society organisations (CSOs) through an MSI structure. EITI implementation requires governments to voluntarily subject themselves to a significant degree of scrutiny. For corrupt ministers, joining EITI appears irrational since it should significantly increase the risk that their misconduct will be exposed and they would be forced to give up a highly lucrative stream of private gain. Yet EITI has steadily grown over the last thirteen years, with 54 countries now meeting or progressing towards a standard that has itself become more demanding over time. EITI meets the conditions for success suggested by club theory. Joining is costly: the implementation process is long and onerous, with two-and-a-half years allowed for progress from candidacy to full implementation and first report. Not all countries manage to undertake the necessary commitments in the given time. Some countries make the first public pronouncement of their intent to join but do not progress further, suggesting that they are put off by the costs and perhaps the risks of embarking on implementation. Implementation requires governments - and companies - to expose themselves to scrutiny through the publication of reports, but also to invite enhanced day-to-day criticism because of the inclusion of CSOs in the multi-stakeholder group (MSG) that implements and oversees the EITI standard in-country. For governments that are not accustomed to entering into dialogue with CSOs, this can feel like a major challenge to their authority. Even for governments that engage frequently in consultations with civil society, the structured nature of the EITI implementation process weakens their negotiating power vis a vis CSOs since they are unable to control the agenda. Moreover, local CSOs involved in MSGs gain access to training and resources, as well as support from international peers, equipping them to be more skilled and forceful in their role as watchdogs on national governments. Implementing the EITI standard wins governments selective benefits. The EITI has become a key tool for signalling commitment to improved governance in the extractives sector and this brings many reputational benefits in international spheres. David-Barrett and Okamura  find that donors value EITI implementation as a step towards improved natural resource governance and that countries are rewarded for progress in implementing the EITI standard with increased aid flows. Government proponents argue that EITI membership helps countries to secure other benefits such as debt relief, access to credit, and foreign investment. As such, the decision to join EITI can be seen as a two-level game, in which governments of resource-rich countries are persuaded - by the promise of reputational and material benefits - to enter a certain part of the game board, relating to transparency commitments, which would otherwise be blocked by local elites. The provision of material benefits by international actors helps incentivize them to move into a new segment of the game board, in part by providing leverage for reformers to use over their less reformist peers in the domestic game. The process of monitoring implementation, meanwhile, is meaningful in EITI and is made more so by the international dimension. At the national level, the MSG creates channels of dialogue among governments, CSOs and companies, increasing mutual scrutiny of each other’s activities. The role of the international dimension is to provide access to a sphere in which different norms prevail and can be used as the benchmark for propriety, kickstarting the process of ‘norm diffusion’. In other words, the international dimension provides access to a ‘principal’ that is seen as credible, because not tainted by being embedded in local political loyalties and reciprocity networks, and which is likely to be motivated by its own reputational concerns to act with integrity. The fact that the reconciliation of payments and receipts is conducted by an independent and external auditor provides credibility that the ‘policing’ of the process will not itself be corrupted because it is removed from domestic political dynamics. This helps to reassure individual actors that free riding will be checked and violators of the norm shamed. This in turn helps them to overcome the collective action problem that might otherwise have deterred participation. The EITI process also includes sanctions for non-compliance, largely centred around naming and shaming, and ostracisation from the club. Occasionally, countries are suspended for failing to maintain standards or for unacceptable treatment of CSOs. The international dimension is critical once again because these decisions are made by the EITI secretariat. While the international nature of the EITI secretariat does not of course make it immune to corruption, it does exist within an international sphere where its actions are watched and criticised. This has been demonstrated on occasions when the EITI secretariat has come under pressure, typically from international CSOs, for being too easy on governments that were failing to uphold civil society freedoms and thereby undermining the effectiveness of the MSG in their country. These arguments are not uncontested. EITI has many critics who argue that it is not strict or tough enough, that it goes too easy on governments that do not allow sufficient freedom to CSOs, and that it does not achieve its overall aims of curbing corruption [49, 50, 51, 52]. On their reading, it is not so difficult to explain why governments are motivated to join: EITI membership is simply cheap talk, allowing governments easy access to benefits without undertaking meaningful reforms. This article argues that implementation is indeed onerous, while expectations about the ability of the initiative to transform a deeply rooted problem in a short time may be too high. So far, we have focused on the motivations of governments to implement the standard; we now turn to the private sector or ‘supply side’. Companies can become involved in EITI in two ways: first, if the government of the country in which they work implements the standard, then they will be required to participate and publish what they pay; second, companies can also become EITI supporters: they make a financial contribution and put their name to the initiative. In the first case, companies, perhaps particularly transnational companies (TNCs), often welcome the initiative. Already under intense scrutiny from civil society, and often criticised for failing to contribute enough to the local communities in which they operate, companies appreciate the opportunity to show how much they pay to governments and to engage with CSOs in a more cooperative context. The information disclosed in the EITI report may allow them to shift the blame for a country’s ‘resource curse’ on to governments and deflect criticism of their own role. On the other hand, though, the fact that they are compelled to comply with the standard in such cases diminishes the reputational benefits, since the action is not ‘voluntary’ and hence does not have the signaling power that a voluntary move would have. Part of the benefit for companies comes once again from the international dimension. One problem for transnational corporations (TNCs) in dealing with corruption risk is that they seek to comply with best practice international standards on anti-bribery and corruption compliance - not least because they typically fall under the jurisdiction of the FCPA, by virtue of issuing securities or doing business in the United States – but find it difficult to ensure that their employees comply with these standards. If they are operating in emerging markets where corruption risks are great and social norms about business practices different, often employing local agents that are embedded in these communities and cultures, this may expose the company to considerable legal and reputational risk . In this context, adhering to and upholding EITI standards might be another way of demonstrating their commitment to international norms and business practices, helping them to raise awareness about their values and drive the message home to local employees. In addition, the forum provided by the MSG provides an opportunity for company executives to talk openly to one another about how they manage the challenges posed by operating in high-corruption environments. The presence of CSOs in the MSG also provides a bridge between multinationals and local communities, spanning the international dimension as well as the corporate-civil society divide to build more open networks, which research suggests are beneficial for companies. According to the International Maritime Organisation (IMO), around 90% of world trade is transported by sea and passes through ports (IMO: ). The IMO has historically acted as a global regulator, although in recent years a number of voluntary private regulation initiatives have emerged to tackle specific problems where the IMO had been somewhat slow to act, particularly in the areas of pollution and private security [54, 55, 56]. Corruption in ports constitutes a non-tariff trade barrier , impeding economic and social development, particularly in developing countries. Corruption in ports occurs because ships have to meet certain local regulation sand satisfy the requirements of the port authorities before they can load or unload their cargo and move on. Typically, they must allow inspectors to come on board and check documentation, such as the ship’s inventory, for compliance with customs rules. This provides an opportunity for corrupt port inspectors to extract bribes or facilitation payments. It is relatively straightforward for an inspector to find fault with even the most diligently maintained inventory. For example, port inspectors have been known to query the fact that pots of paint to be used for refurbishing the ship were not listed on the inventory. In one particularly shameless case, an inspector found fault with an inventory for not listing the oil that was in the ship’s engine. Faced with such demands, ships’ captains face the choice of arguing the point and perhaps wasting days in port while the case is resolved, probably harming their reputation with clients and potentially losing business, or paying bribes and moving on swiftly to deliver their cargo. Since delays in the shipping business are costly, and the sector is highly competitive - with another ship often at hand to take on a shipment - many simply pay up. Indeed, respondents confirmed that many ships routinely carry a large supply of cash in their safes, ready to hand over to inspectors if needed. Frustrated by these problems, a number of maritime shipping companies came together in 2011 to discuss collective action and subsequently to form the MACN, which was formally launched the following year (see http://www.maritime-acn.org). MACN is comprised of vessel-owning companies in the maritime industry, including cargo owners and service providers in the maritime supply chain. The network seeks to encourage companies to commit to an Integrity Pact, to eschew corruption demands when faced with them and to work together to understand and eradicate the root causes of corruption. Although the sector is much more fragmented than extractives, which might be expected to make collective action even more difficult, a number of the biggest market players have signed up to and invested in the initiative from the start, accounting for a sizeable market share of global shipping. MACN initiates action in specific ports, bringing together governmental authorities and civil society groups to exert pressure on ports to clean up their act . The network has implemented projects on a port by port basis, thus far in Nigeria, Argentina and Indonesia, building coalitions with government bodies, international organisations and local stakeholders to change structures that support or encourage bribery. In Argentina, for example, MACN first used its network to collect data on the types of corruption which prevailed in Argentine ports, identifying challenges in two main areas: agricultural inspections, where bribes were solicited to overlook or sanitise allegedly unclean grain holds before new goods could be loaded; and customs clearance, where bribes were solicited for alleged failure to comply with customs declarations. In partnership with a local project partner, GovLatam, MACN engaged with a number of local stakeholders and entered into dialogue with the relevant ministries. This led to the re-drafting of regulations for surveying vessel holds and for customs inspections of a vessel. MACN is also supporting the provision of training on the new regulations, creating a database for digital recording of inspections and risk framework and has catalysed the establishment of an independent transparency unit within the government. The network started with eight founding members in 2012 and has since grown to over sixty-five members. Once again, from an individual company perspective, this seems irrational and defies the logic of collective action. The short-term interests of a company are surely to pay bribes and avoid incurring the high short-term costs of refusing to pay. Moreover, bribery in ports is difficult to police and hence the risks of being caught paying bribes are relatively low. Indeed, there is also a possibility that the bribes would be interpreted as facilitation payments, which are exempt from the FCPA. Thus, how can we explain the establishment and success of the MACN? What is it that persuades shipping companies to join? In some ways, MACN appears much less costly to join than the EITI. There is no long implementation process for companies, no standard with which to comply. Founding members have donated the time of their staff to get the initiative under way as well as contributing funds to the establishment of a secretariat, but these costs are relatively insignificant. However, there are direct costs involved in committing to eschew demands for bribes. In a highly competitive market hit by a global economic downturn, refusing to pay bribes will almost certainly lead to a loss of business, as clients can easily find substitute ships to carry their goods rather than face delays. This makes the commitment by MACN members all the more significant, though, and suggests that the initiative does in a way meet the condition of costly membership. Moreover, MACN appears to be successful in attracting members because it once again provides a valuable reputational signal that allows companies that join to access selective benefits. This signal is read by potential clients that are themselves motivated by a desire to be part of an international club of ethical businesses. These clients may remain loyal to MACN members if they understand that delays are caused by the decision to uphold integrity pacts. MACN has sought to accelerate the process of building a market for integrity by pursuing an advocacy agenda that seeks to link membership with anti-corruption goals intrinsic to other third-party certification schemes that are already in use by shipping companies, including the RightShip scheme and TRACE International’s Anti-Bribery and Corruption Compliance work. This in turn helps to spread the norms that MACN seeks to promote by adding weight to the business case for embracing such standards. In addition, the signal that companies send by joining the MACN might be received and understood by the bribe-extracting agents on the demand side – the port authorities. MACN’s collective signal to port authorities might act as a threat that systemic wrongdoing will be exposed, pushing corrupt agents to change their behavior. An international dimension is also important in attracting local companies from corruption-prone emerging markets to engage. One interview with an executive from a company in the shipping sector in a prominent emerging market revealed that the company had taken significant risks by introducing a zero-tolerance policy on bribery in ports. Other employees had initially scorned the key opinion leader responsible for implementing the scheme and complained that the policy would cost them business. However, over time, the company had developed strategies for supporting employees in resisting bribes, and the demands had eventually begun to decline. An unexpected consequence of the company’s approach was that it began to attract business from TNCs that were keen to demonstrate their anti-bribery credentials by ensuring that their supply chain had the same zero-tolerance policy as themselves. Thus, the company gained access to new business and market opportunities as a result of its zero-tolerance approach, turning a business cost into an advantage. Monitoring and sanctions are more problematic in the case of MACN. It is very difficult for network members to police the behaviour of their competitors, to check whether or not they are complying with commitments to refrain from paying bribes. The network has largely used local civil society to put pressure on port authorities and inspectors in ports, which means that it does not benefit in this aspect from the additional credibility provided by international validators removed from domestic political dynamics. MACN uses the international dimension for leverage in a different way, however, by using diplomatic channels to exert government-to-government pressure on individual ministries and ports. In Indonesia, its project to end corruption in customs clearance in the port of Jakarta is partly funded by the UK Foreign and Commonwealth Office and is able to draw on this diplomatic resource to put pressure on the Indonesian government, which then in turn seeks to ensure that port authorities comply. Table 1 sets out the ways in which the EITI and MACN fulfil the conditions elaborated by club theory. Although the two initiatives examined here differ on the extent to which they meet the conditions, it is clear in both cases that the international dimension makes for a richer and more varied set of possibilities. Most notably, the international dimension increases the selective benefits that are on offer, by providing access to international organisations and actors with resources that are valued by governments and companies in developing countries. It also plays a key role in adding credibility to the monitoring and sanctions function, in particular by granting access to a ‘principal’ removed from the pressures of domestic politics and embedded within international norms that set high store in integrity. In any given initiative, the various actors – public, private and third-sector, national and international organisations - interact in a number of different ways. In the case of EITI, governments influence their peers to self-regulate but also to improve regulation of companies operating on their territory. In the case of MACN, private-sector actors initiate and drive reform by government actors (e.g., port authorities), by harnessing both market power and diplomatic pressure (i.e., other governments, embedded in different norms). Looking more broadly across a range of initiatives, there is no clear consensus on what kind of institutional design works best, although there is some evidence that a flexible approach is important to building the trust necessary to catalyse collective action in such a sensitive area; this tendency to allow initiatives to grow organically may explain the variation in models that can be observed. In all cases, cooperation between public and private actors is critical, reflecting the fact that bribery and corruption is typically based on an exchange between these two types of actor. However, the international dimension extends the set of potential influence channels, creating opportunities for multi-dimensional and cross-cutting relationships. In terms of intra-sectoral international-domestic relationships, the promise of receiving business or preferential treatment from multinational companies can incentivize domestic companies to conform to club standards; pressure from international donors can persuade governments to come on board; and international civil society groups can assist domestic CSOs in holding local players to account. However, international CSOs also put pressure on international donors to maintain high standards, while local companies lobby their own governments to support and recognize their efforts to build integrity and multinationals sometimes push club organisations to extend their reach to new markets where they wish to level the playing field. In addition to providing a theoretical framework for analyzing anti-corruption clubs in international business, this research also raises a number of new research questions. One relates to the variation in importance of different institutional features over the life cycle of international anti-corruption clubs. Many of the cases considered here indicated that the motivations of early joiners differ from those of late joiners, and that the trade-off between breadth and depth alters over time. Future research could also use this theoretical framework to explore the extent to which the success of an initiative depends on the size and concentration of a sector, the nature of the selective benefits, and the power dynamics among stakeholders both within and across national boundaries. B-Team. (2015). Ending anonymous companies: tackling corruption and promoting stability through beneficial ownership transparency: the business case. http://bteam.org/plan-b/ending-anonymouscompanies-report-published/. Accessed 29 Oct 2017. Potoski, M., & Prakash, A. (2005). Green clubs and voluntary governance: ISO 14001 and firms’ regulatory compliance. American Journal of Political Science. https://doi.org/10.1111/j.0092-5853.2005.00120.x. Börzel, T. A., & Risse, T. (2009). The transformative power of Europe. KFG Working Paper Series, 1. http://userpage.fu-berlin.de/kfgeu/kfgwp/wpseries/WorkingPaperKFG_1.pdf. Accessed 29 Oct 2017. Knack, S., Biletska, N., & Kacker, K. (2017). Deterring kickbacks and encouraging entry in public procurement markets evidence from firm surveys in 88 developing countries (World Bank Policy Research Working Papers No. 8078). Retrieved from http://documents.worldbank.org/curated/en/817871496169519447/pdf/WPS8078.pdf. Moberg, J., & Rich, E. (2012). Beyond governments: lessons on multi- stakeholder governance from the Extractive Industries Transparency Initiative (EITI). Retrieved from https://eiti.org/files/08_Moberg_Rich.pdf. Ölcer, D. (2009). Extracting the Maximum from the EITI. OECD Development Centre Working Papers 276 (1). http://doi.org/10.1787/225520261678. Scanteam (2011). Achievements and strategic options: Evaluation of the extractive industries transparency initiative. Achievements and Strategic Options: evaluation of the Extractive Industries Transparency Initiative. Retrieved from http://eiti.org/files/2011-EITI-evaluation-report.pdf. IMO (International Maritime Organization) (2015). Private Armed Security. Available at: http://www.imo.org/en/OurWork/Security/PiracyArmedRobbery/Pages/Private-Armed-Security.aspx. Accessed 10 Feb 2017. Sequeira, S. & S. Djankov (2010). An empirical study of corruption in ports. MPRA Paper No. 21791. Available here: https://mpra.ub.uni-muenchen.de/21791/1/MPRA_paper_21791.pdf. Accessed 10 Feb 2017. MACN. (2015) Concept note. http://www.maritime-acn.org/about-macn/. Accessed 29 Oct 2017.